The Mary Jane’s appears in the second part oft the runaway show. The Mary Janes were a very long time a so called “No Go” for fashionistas. Now reinterpreted by Miuccia Prada, they are the absolute „Must Haves“ of the fashion world for the autumn/winter season 2015/16. 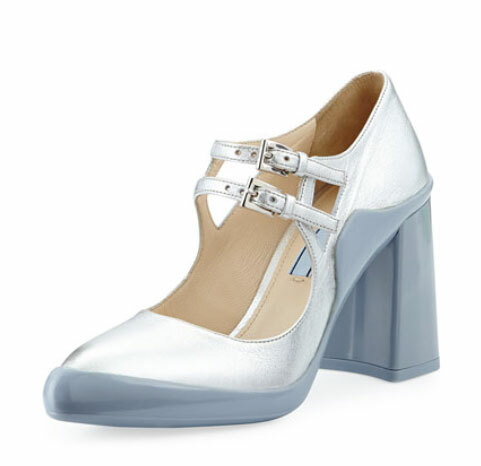 In comparison to the classic form with thinner heels, they come along with a block heel out of the 70ies. The enormous advantage: From behind vigorous calves act visually more delicate and you can wear these shoes very good to a knee-length skirt. But otherwise: Following year you will find a lot of copies from this kind of shoes. Therefore, buy them now & sell them next summer on www.vestiairecollective.com.